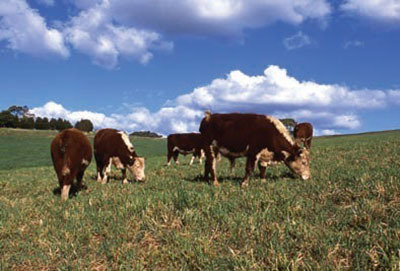 Livestock grazing accounts for 35% of catchment land use. Healthy environments produce good quality water. Catchments include natural areas such as rivers, wetlands and bushland, and human activities such as farms, towns and industry. The drinking water catchments cover 16,000 square kilometres of land - from north of Lithgow to south of Braidwood, and from Woronora in the east to west of Crookwell. The catchments are home to over 120,000 people living in 15 local government areas. Over 60% of the land is privately owned, including 600,000 hectares of agricultural land that is essential to the NSW economy. About 30% of catchment land is national park and bushland. Other significant land uses include horticulture such as vineyards and olive groves. Other significant land uses include horticulture (vineyards and olive groves), crops (canola and cereals), and mining and quarries. The main types of livestock include cattle and sheep grazing, dairies, horse studs, piggeries and poultry production. Cattle pose the greatest risk to water quality, as their faeces can carry human infectious pathogens, such as Cryptosporidium and Giardia. Special Areas cover about 30% of the catchments. By restricting or prohibiting public access to the Special Areas immediately surrounding many of the major dams, this pristine bushland acts as buffer zones to help stop potentially harmful substances from entering the water storages. Other major conservation areas in the catchments include national parks and state recreation areas. Vineyards for wine production and olive groves are the fastest growing types of horticulture in the catchments. The amount of canola and cereal crops varies from year to year, depending on rainfall. Bowral, Goulburn, Lithgow and Moss Vale are the fastest growing towns in the catchments. Before they can be approved, new housing and industrial developments in these areas must pass the Neutral or Beneficial Effect on Water Quality (NorBE) assessment to ensure they will have a minimal impact on water quality. WaterNSW manages and protects the drinking water catchments, and supplies high quality raw water. WaterNSW works together with local councils, landholders, government agencies and industry to ensure daily activities - particularly building, industry and farming - do not harm the environment that our drinking water comes from.